Sorry you didn't get the email... I know I've emailed it to someone before... might have been Dave (dproman). I'll email you the file again, along with this logo I've designed so you can experiment with the colours. I'm going to get back to doing the graphics for the original playmat now since there's that convention coming up in March, but I'll watch this thread to see how the logo develops! In case anyone wanted to do a study of what goes into remixing a logo (or is just plain curious), here's the page of sketches I did. Yeah, that's right a ~single~ page is all I did... I probably should have done more, but my mind was pretty made up at the moment. Basically I want to show what other designs I attempted in the process, incase someone sees any potential in these prior sketches. 1: I wanted to work the dragon into the castle as close as I could so that the logo would fit into most places easily. In this version though, I shot myself in the foot: I didn't mean for the dragon to be 'breathing on itself'! Also the position of the head would put the text too high. 3: Tried an entirely different approach. Immediately failed. You can tell by how little I worked on the lines, can't you? 4: I play with the wyrm-as-THE-Q concept. This sketch eventually became the master mould of my current design. In the final design however, I switched around the ends of the head and tail to reach a more streamlined logo. Logos need to be as streamlined as possible to be able to reproduce at smaller sizes, such as letterheads or decals for various objects. I hope you don't mind, but I slightly edited one of the logos in paint. I thought it would be smart to edit the rear paw above the head to make it look less like the wyrm is standing on its own head. I also altered the body slightly to retain the q-shape a bit more. It should be pretty clear what I altered, as its nowhere neat perfect, but I hope you like the suggestion. Thats a reasonable suggestion though I don't see where you 'changed the body slightly to retain the q-shape' ? It still looks the same to me. I'll have to re-work the feet then. No joy having just two toes XD. I'll move the feet up some. I asked for MissTiffany's suggestion and she wanted to see this in slightly different colors. Do you have an AI file or similar you can email me so I can do it for her? that would be easier than just doing it in paint. the only negative comment on Josh's design was the shape of the flames on the fire. she couldn't describe what it was that looked off, but I think it might've been that it was too regular. fire is a bit more chaotic. The dragon looks like its inviting you to go on the quest. This is wht I said game board mat. I was going to say that the castle needed this anyways...but it was suppose to be a silhouette. Another thing is Joshs' tail...the animaster adopter the tail tip of a wyrm...while Joshs' tail seems more dinosaur-like. the annimaster's is slithery...almost sneaky. Josh already seems to like the animaster's remix..
if you go with Steve's...you might want to show him any additional working on this project so the project will have the same style. So is there a game board mat? if maybe...what are the designs...since Steve likes to work from something..
even if Steve does not do anything else..
but having Steve do it would keep the style alive. I'm glad there are creative people within our community, so please don't take this the wrong way, but every time I see that logo it reminds me of the South Park episode "Smug Alert!". Its probably just me. Though after 7 years of seeing even the best-looking rainbows used in various student reports and projects, you can only imagine what I think about them used in logotypes. The only logo in known history I know of that used a full spectrum successfully (while still being able to be taken seriously) was Apple's... and even that changed later. dont mind the white lines in the first picture, it was an older experiment. What if we didn't NEED to change the Q at all? It's all about human perception what your eyes see and how your brain connects the dots when there's something missing. Do you see just a dragon wrapped around a castle? Do you see a weird, unknown mix-of-a-Q-and-U? Or do you simply see a "Q", aided by it's colour, and the colour of what follows after: the letters "u-e-s-t" ? Designs don't need to be explicit. The same way our brains automatically correct words that are misspelled so that we can understand them. These are the sort of things designers use to their advantage when it would serve the design best. We balance the "typical" with the "aesthetic". In other words, do you want something that is typically obvious, or would you rather have something that is cleverly sculpted, that tickles the mind into bridging that little gap of information? I hope these things help. Multi-coloured flame breath: Will never work, would be a complete disaster. We are not designing for little children. I have two, by the way, and they love this stuff, but for the sake of my intended target market, I will stick to what appeals to THEM, and that target market is at least 8 years - really old adults. The idea behind the multi-coloured dragon was to show that white dragons can breath all colours -- do we really need that information in a logo -- is it crucial that we have it? Will a new player scream "murder!" if it wasn't there? How about a seasoned player? If no, then I stick with the ultimate design mantra: less is more. a.) The dragon (as Jim puts it nicely) looks too timid. If we are to be taken seriously, we'll need a more serious-looking dragon, otherwise people would view our product as 'fan-based' merchandise. We want it to be 'official' merchandise. In such a case where we are lacking in proficient illustrators, one can turn to an alternative method: the ICON. Icons work well for logos because they don't have to have the same meticulous detail as illustrations do. At this point, I believe we are talking about logos and not cover-art for the product? b.) Contrast: The original design lacks this, being mostly white outlined with black. Scaled down to any size with a height smaller than an inch, it would lose clarity. c.) Design space: How well does it fit within a rectangle, and when you do, how much empty space can you see within this boundary? For a logo to be effective, there should be careful consideration to how much unused space there is. A logo will have to fit most rectangular spaces as well. Square logos work best, as do circular ones. There's something you might keep in mind, but when confronted with a design situation like this, a rectangle seems best in making use of as much 'space' as you can within this hypothetical boundary. The new design is not a rectangle per se, but it fills the boundaries of one better than the original, which is more of a rectangle with a large block cut out of the bottom-left corner. d.) Proportions: The castle is as big as the word "Quest". Scaled down, you'd probably notice the castle more than the text itself. This logo would only work well at large sizes, in fact, defeating the purpose of a logo. e.) Type: the type isn't uniform, there's no consideration to the balance of weight in the font. This can easily be corrected though, but that alone doesn't fix the logo, considering the other issues. The new logo isn't without it's problems, the biggest being COLOUR. I have yet to find a suitable scheme for it, and as I'm working on other things DragonDice, I'll have to put this task aside for the moment... unless someone else can come up with a suitable palette. For colour, you would need something that reproduces good on both light and dark backgrounds. You may have specific versions for dark coloured and light coloured backgrounds, or you may have just one scheme that works well with any background. Drop shadows help in defining shapes -- use them wisely. Contrast is important, so even if you have a red flame, if your bg colour has the same value (value is the brightness/darkness) there will be little contrast there. A good way to test contrast is to look at the colours in black and white, either by printing it and photocopying it or by converting it to greyscale and them observing the contrast. Otherwise I think I've fixed most of the issues that the original design introduced. Once again, this is no contest for me. I'm simply applying my skills to make this thing WORK, and I understand you are all doing your best to that effect too. PS. Forgot Funky's colour concept -- this will not work when reproduced at smaller sizes. The arms will all disappear and while it emphasizes the "Q" it destroys the dragon. In this case, if the Dragon-as-THE-Q concept doesn't work, we can then try something entirely different. Reload the original design -- have a look at the WIP sketches and try to reload them and attempt the original design as a more icon-based design. Again, icons work best with logos. 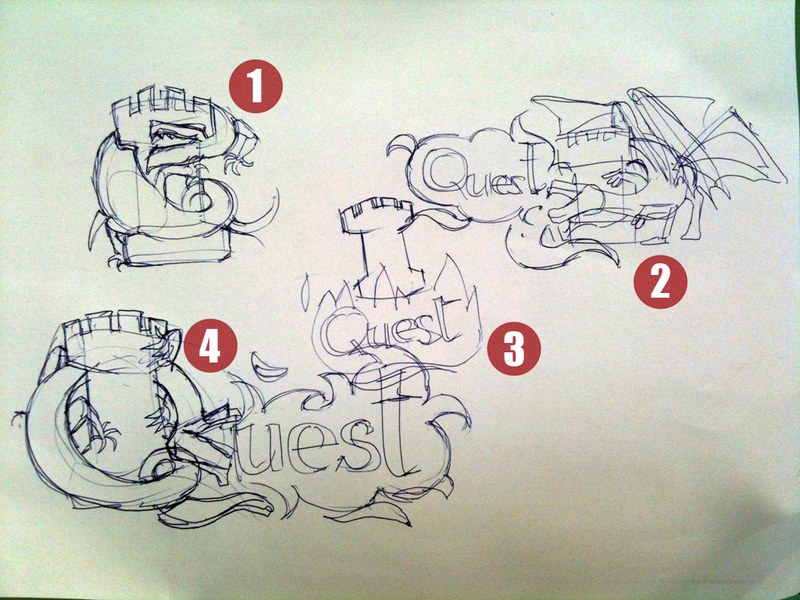 � Everyone read it as "quest"
So it seems, this is not an issue with colour, but the proportions of the dragon forming the "Q". I shall scale down the limbs as well as the head, this will help define the circle a bit more. Interesting study with the non-native speakers figuring it out right away... does this mean there isn't anything wrong with the Q after all (from a functional point of view)? OK folks, here it is... the modified version. I'm loving it. Can I just say that this would NOT be possible without all the input I'm getting here? So once again, I sincerely have you all to thank for how this is developing. First, I like how the castle is more complete, and less fragmented. The new shape also has a sense of a touch of magic to it, due to the swirly shape created. I've addressed the issue regarding the colour. So now we have a coloured version. This version is slightly different from the black and white version in that there's been an outline cut out for the text in the breath shape. I did this because the text felt slightly orphaned from the Q-shaped dragon when colourised. By cutting out an outline in the breath shape, this gives the text shapes the same outline that the Q has in the dragon. In the black and white version however, the cutout would only complicated the breath shape, so this isn't needed, as there is no outline needed for the black and white version. For colour, I suggest 2 colours for the logo + background colour. This simplifies things and keeps things more consistent. Adding a third colour will only make it more difficult to fit in with different-coloured backgrounds. I'll be sending you the file now, Cliff. I really like the second one. A lot. Thanks. I'll let her play with it some, but to let you know, what she's considering is the huntergreen, blue, light gray and orange from the currently logo. if they work, they work. If they don't they don't. But playing with it will show the difference. from a structural POV, the only thing I miss is a few 'brick lines' in the castle. I know this doesn't have to match the SFR logo exactly, but if it doesn't detract, then it can only help. I was showing just one method of conjoining the Q.
I would not be so fast to dismiss the need to complete the Q. Try a few designs first. not just in the Q...but the castle's curve seems like it needs to be accentuated.